Published on September 25, 2018. Updated September 26, 2018. Also in Mindanao Gold Star Daily. What if someone needs to raise roosters in a residential subdivision? How will he make them silent so that the neighbors won’t throw stones at his house? Chickens are sources of noise pollution, we know. I met a German businessman who told me he had to close his beach resort in Camiguin because he ran out of guests because they couldn't sleep because his neighbor had 15 roosters and wouldn't remove them despite complaints. 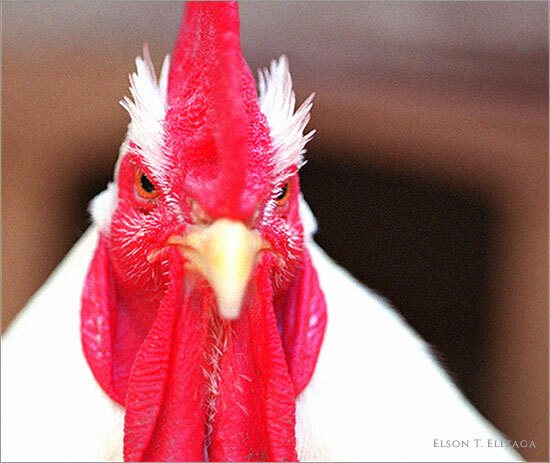 Online, I found four remedies to rooster noise pollution. The most radical of them comes from an obviously pissed-off guy. He wrote: "Use a shotgun". Potato party? That’s the same as camote party, so we might be able to make use of it here. But there’s another article in that century-old newspaper that’s especially relevant. The title is “California City Takes Steps to Quiet Roosters”. But the best device that I know so far is a modern patented invention called NO CROW Rooster Collars.1 It’s a band made of synthetic material and Velcro. Invented by Lauren Taylor, you put it around the neck, but not too tight or the rooster might … you know. There are several YouTube videos of this excellent device, uploaded by happy and satisfied rooster owners.The one by The Crocker Homestead is fun, although he's using an improvised version. Someone told me in an email that he uses a cheap rubber band instead. Well, as long as the rooster doesn’t become the main ingredient of chicken soup, that option should be fine. 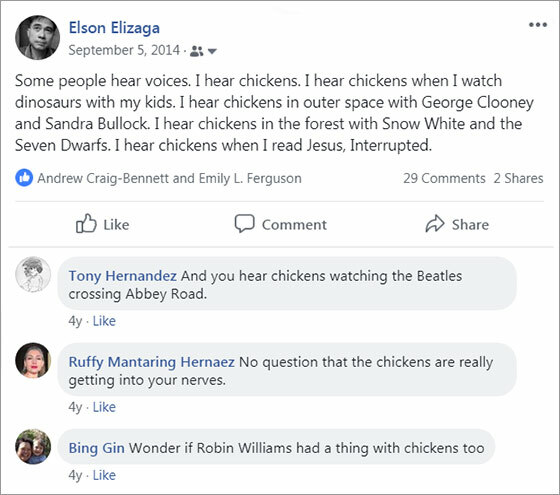 My Facebook post regarding my annoyance with chickens, and the replies of some of my friends. The replies are printed here with their permission. 1 The logo of NO CROW ROOSTER COLLAR is placed in this webpage with permission. This visit counter started with 0 on September 25, 2018.